Is it a ravishing red polka dot umbrella or a fabulously frilly red ladies parasol? Actually, it’s both. Elegant, sophisticated and beautifully finished, this smart red Polka Dot umbrella is fully automatic opening and features a metal frame with white runner and eight light, flexible white fibreglass ribs. It also has a stunning colour contrast detail running down the length of each rib, a matching sumptuous frill and coordinating plastic crook handle, spoke tips and top. Length when closed is 84 cm and they have a generous canopy width, when open, of 94 cm. 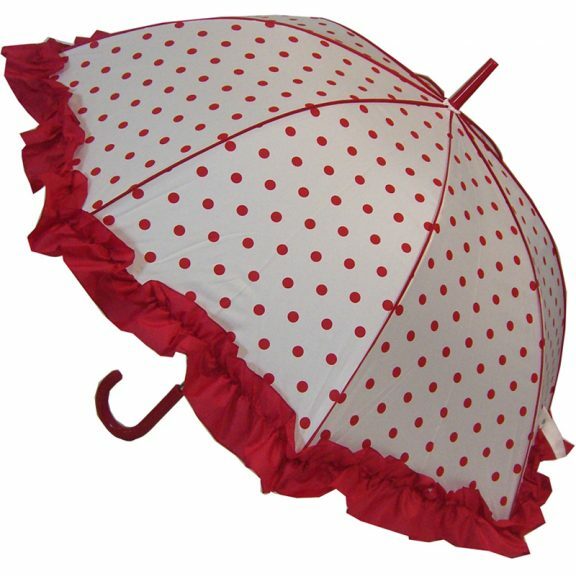 This red polka dot umbrella is perfect in the rain and also as a fabulous frilly parasol.